At Framerite Auto Repair in Baltimore, MD, we have remained the trusted choice for auto repair in our community since 1954 and counting. Many of our customers have been loyal to us for years because we treat them like family. Our goal ever since 1954 is to offer the best services available at affordable prices to keep your vehicle safe and reliable. 1985 and then at Goodyear from 1985 to 1988. He opened his own business (Taylors Automotive) in 1988 until 1999 when he combined his business with his father’s - Framerite Auto Repair. He is a third-generation owner and has continued his family’s legacy. Outside of running his business, Bill enjoys coaching little league baseball, camping, playing golf, and spending time with his family and grandchildren. Our associations include ASA, WMDA-CARS, ATI, and NAPA AutoCare. 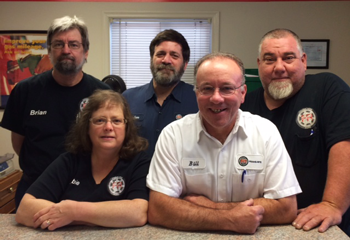 All of our techs are ASE certified, with one ASE Master technician. They all have over 30 years of hands-on experience in the automotive industry. Our shop gives back to our community by taking part in many charitable events and sponsorships, including Boy Scouts, Sponsor Hamilton Little League Baseball, K9's for Warriors, Christophers Clubhouse, Brakes for Breast Cancer Research(Cleveland Clinic), Toys for Tots, St. Ursula's School, Lutheran Mission Society Compassion Place, and more. For honest and reliable auto repair and service, bring your vehicle into the trusted mechanics in Baltimore, MD, here at Framerite Auto Repair.